One of the reasons why I'm using Firefox as my default browser is because of the add-ins. Mouse Gestures is an add-in for Firefox. Allows you to execute common commands (like page forward/backward, close tab, new tab) by mouse gestures drawn over the current webpage, without reaching for the toolbar or the keyboard. You can also use click-only "rocker" gestures which are even faster than drawn gestures. After seeing this I'm glad that Vista have been delayed. After all. we do not have "software recalls", do we have? 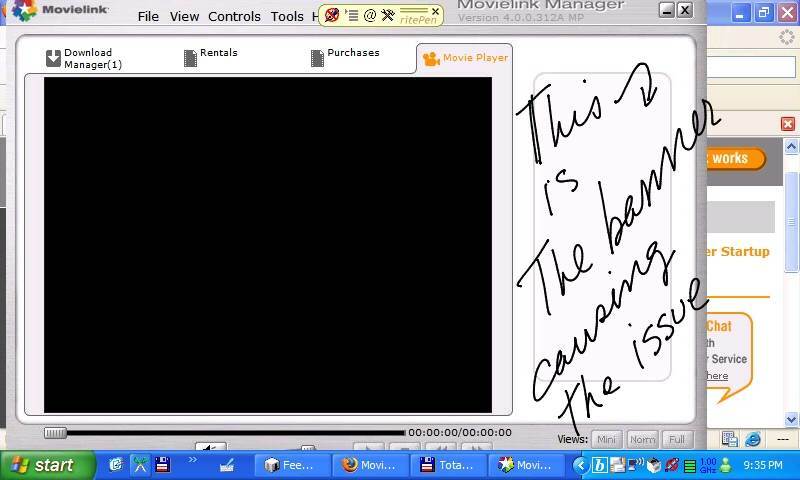 CapturePad is a cheap way to create movies of what you are doing in your UMPC, Tablet PC or PC. 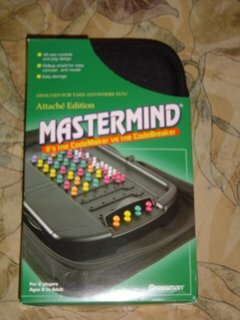 the above video of iHangman was created using this tool and in my eo V7110. Link to my personal blog. Yesterday one of our readers asked me about the reassignment of the Page Up and Down Buttons in eos. I never liked the way these two buttons work when you are in a Browser, it jumps from link to link. And when Inn in a document the jump to next Page like confuse me a little bit. So the reassignment of these two buttons to Scroll up and Scroll down Mouse functionality seemed to me a good idea. And this is how is done. 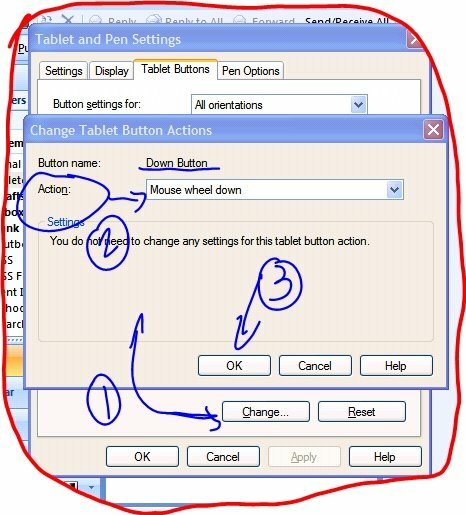 You go to Start, Settings, Control Panel, Tablet and Pen Settings. Click on Tablet Buttons, Select "Up Button" from the left list and then click "Change" and follow the instruction s from the net two screen shots. I'm sure that eo Owners will love the way these two buttons work after this change. OrigamiInfo.com has published a graphic analisys demostrating that the Mysterious UMPC Picture posted yesterday at Ultramobilepcs.com is a FOUNDER UMPC. You can find a very good review with a lot of pictures at Judie's Diary. The first batch of cPC to be shipped does not include WiFi neither BT, but they are selling them with a AmbiCom 802.11g WiFi CF card. According to this site, in a future batch WiFi and BT connectivity will be included in those units and the owner of the first batch will have the chance of upgrading their units to this functionality. Yes, you can buy them on ebay now. There is a guy asking 1700 dollars for an eo with 1 GB and 60 GB 7200 RPM HDD! Wow! I'm sure that many of you guys are thinking about to move your iTune collection to your UMPC and for sure you already found that this is one of the most difficult task that you ever will find. Well, I found a program that will help you to do that: Copypod. Copypod allows you to copy your music files from your iPod to your UMPC, including your ratings, how many times you have played a song, when was the last time and It also copies your playlists. I moved my music collection of about 4000 soungs from my notebook to my eo. The process is a little bit tricky, first the program refresth the list of songs, then it copies it to your iTunes folder, after that it launch iTunes to refresh your sounds and import your playlists (Be aware that you can't use iTunes during this process). Once is done, you will have to syncronize again your iPod with your UMPC. It seems to me that this happens to me because the whole process ended with some mistakes in some of my playlists. But I'm not sure about this point. During the sync process all your songs and playlist are copied back to your iPod. One thing I did not like about this program. It converts the smart playlists into just regular playlists. I think that this is due to the fact that in your iPod you do not carry the query to create these lists, your iPod carry only the playlist, so that means that even when you get your playlists in your UMPC, they are not "smart" and you will have to end recreating them. The whole process can take you from 2 hours to 4 hours depending of how many songs do you have in your iPod. Yes, that what you read: The old Newton is better than Q1. That's what CNET in Uk is trying to tell us in this article illustrated with pictures of two clowns. Warning: Do not waste your time reading and just enjoy the funny pictures. 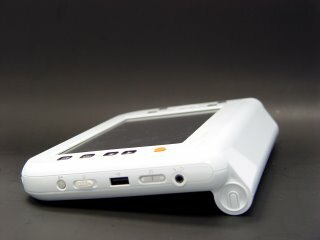 UltramobilePCS.com has just published a picture of a new UMPC coming soon. 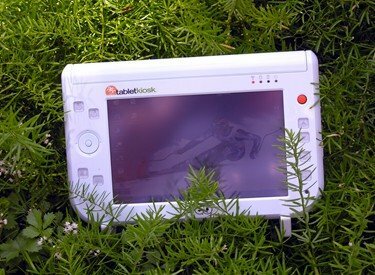 No words about who is the maker of it but I think that problably this one it the rumored new UMPC coming from TabletKiosk! K. J. Penfield is an Elementary School Teacher who think that the Q1 could be a great companion in the Classroom. I am a 5th Grade teacher and am always looking for another tool to use in my classroom. Two questions always come to mind whenever I decide on a technology purchase – “Will this help me become more productive?” and “Will this enhance the learning experience of my students?” The UMPC or Ultra Mobile Personal Computer fits that description. So, I decided to write my own “unbiased” review of the Samsung Q1. Many online sources did not, IMHO (In my humble opinion), see the true place in technology for this device and its brethren. A new VIA Chipset Driver for eo has been released at VIA web site. The new Version 5.09A can be downloaded here. What has been changed in this update can be found here. Sorry guys but I don't see anything about the C3 state issue. VIA has released a new video driver for IGP Chipset VN800, the same one used in the eo V7110. The new driver version 16.94.46.03 can be downloaded here. As usual with VIA there is not any explanation of what has been changed in this release. One thing is clear to me, they for sure have fixed something because the issues that I had with version 3.0 of TEO have disappeared. So - the Eo for taking notes is great. My only complaint in this area is that the battery doesn't last all day, and in a device with this form factor I would use it all day if I could. I do get 2.5 hours out of it under normal use (with the screen backlight turned down a bit), and the extended battery will help too, but going from a Pocket PC you just get used to long batteries - and the scenarios for a UMPC are different than a Laptop or Tablet due to their size. TEO v3.0 has been released and can be downloaded here. I tested this "must have" for any TabletPC/UMPC owner Outlook add-in in my eo and I had some issues with the mouse pointer of my eo getting in the way of ink while filling fields in contacts. I contacted the author and I have to say that I found on him one of those rare cases of good Tech Support. He is receiving soon an eo V7110 to test the program and work in a fix for this issue. Here is another option sold by TigerDirect to add an external monitor or projector to your TabletKiosk eo V7110: Tritton SEE2. The TRITTON SEE2 USB 2.0 SVGA Adapter instantly allows you to add a second display through your USB 2.0 port. Simply install the included drivers, plug the SEE2 into the USB port and your ready to go. Linda A. Epstein has published at TabletPC2.com a very good review about the TabletKiosk eo V7110. Linda no only writes very well, she also takes amazing artistic pictures of whatever she is reviewing. I'm currently using a VIA in my eo and the only complain I have is that it could have given me 15% more of battery life if it was properly configured. I use normally a Pentium 4 at 2.6 GHz at work and a Pentium 4 at 3 GHz at home. And if you have your eo configured in the way I have mine (1 GB or RAM and a 7200 RPM HDD) you wont notice any problem or difference if you use your eo to work with Office and other Browsing relative activities. You probably will have some problems if you are a gamer or if you use applications with extensive graphics. Thanks to the VIA processor current battery life in the eo is the same that you would see in the Q1 if this one had a Battery 10% smaller. This means that a VIA processor no configured properly performs, from the point of battery life, in the same way than an Intel Celeron at 900 MHz. If the VIA processor in eo UMPCs was configured properly with the processor entering in C3 State, the Battery Life in both devices would be the same even with a 10% smaller Battery installed in the eo. There are problems in the VIA chip set, yes, they are. VIA needs to work more distributing easy to use graphic filters and drivers. I think that they should spend less money in Propaganda in their site and pay a better software developing team. That could put machines using these chips in better condition to compete with Intel. So my conclusion is one, for the majority of people, VIA will be good enough for everything that a common person does in a PC beside Games (at this moment)* and with the advantage of a better battery life and a lower price. * I'm programing in Visual Studio 2005 in an eo with no problems at all. Is that considered normal use? The UX90PS is the version of the latest Sony UX running with a 16 GB Flash Card HDD. This HDD will give you more speed accessing data and around 10 to 15% more battery life than a conventional HDD. My question is: are you willing to pay 470 dollars more for a little bit more of speed and battery life and 50% of less space in your HDD, considering that the UX90P is sold with a 30 GB HDD? You can check the 14 Minutes video review by Akihabara here. Within all the buzz about the new so-called ipod killer, I found an article written by James Kendrick that summarize everything I think about this attempt of Microsoft to conquer the mp3 players market. In just 4 letters, KISS, he has told Microsoft what to do: Keep it Simple, Stupid. OnlyUMPC is reporting about a mysterious new device from Microsoft running on an AMD processor. So far nothing is known about it, even the name is a secret. Could be this the so-called iPod Killer? Christian Falch has released the first version of his Ink Everywhere application. I have not tested yet but I'm planning to do that as soon as I get home tonight. This first version of this tool can be downloaded here. Reading one of my favorite blogs, JKonTheRun, I found a post of Kevin talking about a new patent filed by Apple about a touch screen that sence the proximity of any object such as your finger. This like Kevin said, sounds to me like the hover capability found in Tablet PCs. Wow! If I could get an UMPC with a touch screen like that! Microsoft has released an article showing what it the path to follow if you are planning to upgrade your machine to Vista. 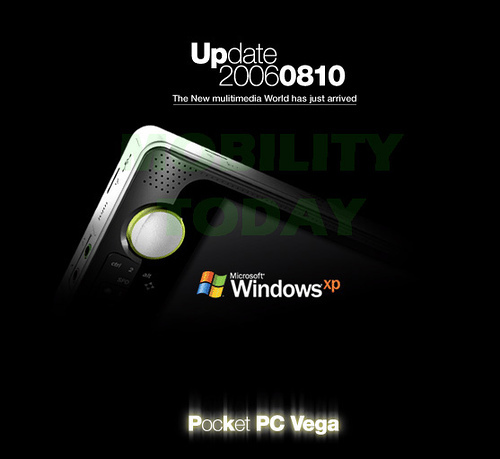 In our case (UMPCs), we need to buy the Business or Ultimate Edition if we are planning to upgrade our machine installing Vista on top of Windows XP Tablet PC Edition. If you are planning to reformat your HDD and start over with a fresh installation then you can buy any of these two versions already mentioned or you can buy the Home Basic or Home Premium. 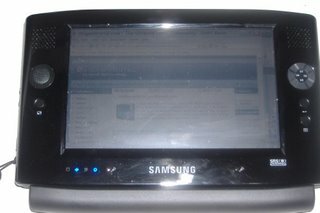 Carripad is informing about two videos released by Hugo Ortega where he compares the eo and the Samsung UMPC. According to Hugo, who owns both machines and has been using both for a long time now, the eo is the productivity winner within these two machines due to the presence of a joystick kind of mouse and more enter buttons. If you are using a lot Dialkey or you are planning to use more the DialKey or the touch functionality of the display with your fingers then the Samsung Q1 is the winner. For inking, the winner again is the eo V7110. In the multimedia department, the Samsung is the winner; two speakers, mic, AVNow, are features that help a lot in this category. Stylus, the winner here is the eo V7110, Hugo has a very bad opinion of the Q1 Stylus, he says that it's ugly and no functional at all. Changing the resolution, the eo is the winner again. The final verdict of Hugo is that the Samsung is the multimedia machine ready for movies, music, etc. The eo is better productivity tool for professionals. Here is the link for the video no 1 and the link for the video no 2. In my opinion this is the best review and the only one at this moment that compares both machines showing users what to expect of each one of them. Bravo Hugo! The Port Replicator is the perfect solution for PowerPoint presentation even when it can be used too as a temporal docking station. Update: It's confirmed, this is the eo V7110 Port Replicator and what you see in the right side is a SD Card Reader Slot. I have seen comments around saying that some companies - I don't want to mention names - are telling their customers that if they open their UMPC to upgrade the RAM or HDD that will void their warranty. Well, the true is that if any company tells you that you can contact your lawer and sue that company in case you need it. At least here in USA we have the Magnuson-Moss Act that says clearly that there are three prohibitions under the Magnuson-Moss Act. 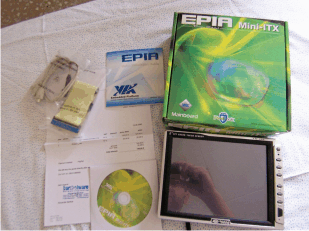 They involve implied warranties, so-called "tie-in sales" provisions, and deceptive or misleading warranty terms. Although tie-in sales provisions generally are not allowed, you can include such a provision in your warranty if you can demonstrate to the satisfaction of the FTC that your product will not work properly without a specified item or service. If you believe that this is the case, you should contact the warranty staff of the FTC's Bureau of Consumer Protection for information on how to apply for a waiver of the tie-in sales prohibition. In words close to our main topic. Current UMPC sellers or makers can tell you... "we will not cover under our warranty any failure of any of HDD or Memory installed by you or any other company no authorized by us". But if the device is not working properly and the problem is not caused by your new installed by you HDD or Memory card the company that made that UMPC has to honor their warranty. Do not get me wrong, I do not want to encourage people to open their UMPCs to upgrade them if they do not know what they are doing because like I above said, if during this process you end breaking the device that could void the warranty. But I want also have this point clear here. If you install any hardware in your device and your device for any other reason no relative to this upgrade is not working any more in the way it's supposed, your warranty covers you in this case, and the maker of your UMPC has to fix it at not cost for you. If I'm wrong in what I'm saying or any clarification is needed by any of the OEMs/Makers/Resellers that I know sometimes read my blog, please go ahead and clarify it here. I just received some tips about what is going on at TabletKiosk. The Extended Battery should be shipped in August - "we've had huge demand so we are ramping up plenty of stock before releasing..."
I could not get any pictures from TabletKiosk of the so called "Port Replicator" that should be released before the actual "Docking Port" but this is what they told me: "it's a compact box with curved edges like the v7110 and has USB x 2, VGA Out and 10/100 Ethernet connection and plug into the eo's docking connection. It's great for mobile usage, since its so small." All this followed by "we are making a big commitment to the UMPC platform" - I don't know why but this reminded me the rumors about... I wont make any comment about this phrase, you better make your own conclusions. 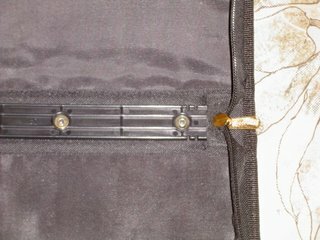 Jenn from Pocketables has posted a nice review with a lot of pictures about a Battery Bank that she bought that I think could be useful to many Origami Owners. After ctitanic posted his review of the NBMate-118, I went in search for a similar solution to my battery woes. One of the things that attracted me to the one I bought was that it offers an incredible voltage range (3V to 24V) and allows simultaneous charging of up to three gadgets. I could not believe it until I read the whole 8 pages of this thread (Spanish). This guy by the alias of Schneiderjordan is building his own UMPC. No, I'm not joking. He started the thread saying that he wants an UMPC but he wants to pay only 500 or 600 Euros. Knowing that he will have to wait a lot before he finds an UMPC with that price range he started to build his own. He bought a 8 inches display on ebay and a motherboard and he started the project. What can I say?! Microsoft, you better be careful with this guy! Daewoo Lucoms releases a new UMPC, the Solo M1, according to news published by TelecomsKorea. This device use an Intel processor at 900 MHz. 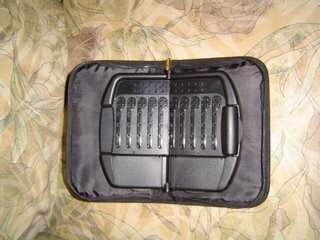 The UMPC supports for PMP, MP3 player, DMB, Web CAM, Bluetooth and navigation. It is powered by Intel 900? CPU and MS Windows XP Tablet Edition. I tried Movielink the new rental online service in my eo. Total disaster. The so called "Download Manager" or "Movie Manager" freezes on me as soon as it refreshes the banner with adds in its right side. 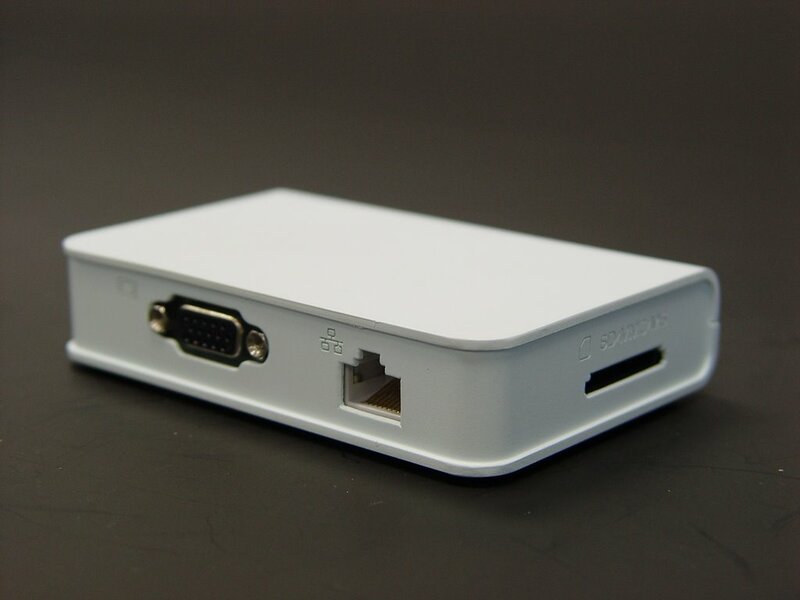 We will be releasing a Port replication box, in early august that will have all the ports of the Docking Station (USB x 2, VGA out, 10/100 Ethernet, power. This will have the same functions of the docking station, except for holding the eo v7110 in a upright position. GottaBeMobile has published a news about a video of Otto Berkes talking about Origamis and the future of these devices that I never have seen before. That's the question posted by Jeff at his blog BigBeaks.com. I think that there are many parental control kind of programs that can be used to keep your child under control filtering the information they access. For example, one thing that I did some time ago was to install VNC in my daughter laptop when she was younger and let her know that I can see what she is doing. To take away computers from children seems to me an extreme measure that does not help at all. There hare been some attempts to install Linux in Q1s but it seems to me that this person has gone farer than the rest in this adventure. I really think Linux has a future on such a device, but a good integration for on-screen input is needed. Not only a good on-screen keyboard, but a handwriting recognition software as well. I received some news from UNlFIRM the makers of MUGEN POWER Batteries. The first prototype of an extended battery for Ql is ready and is being tested at this moment. It's around 3 times more powerful than the original Q1 Battery. 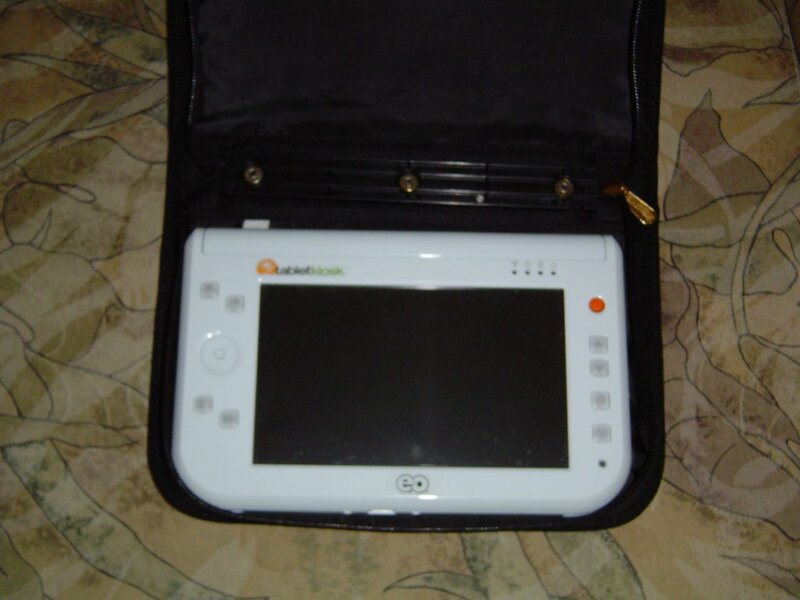 In another hand, they just received an eo V7110 from TabletKiosk and they are starting to work in the eo Battery too. 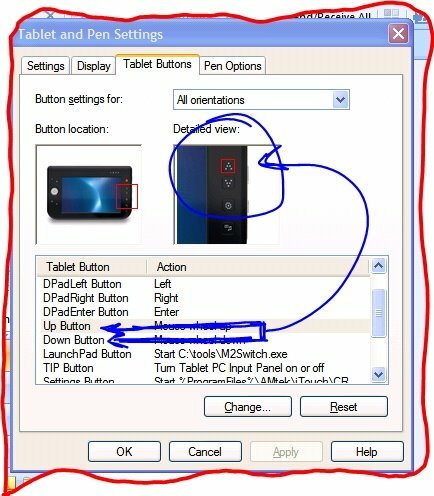 Christian Falch is working in a new program that will allow Tablet PC - and I hope that UMPC too - users to write everywhere in the screen eliminating the need of the TIP. Even when I was one of the first ones to know about the new UMPC skin Yesterday, I did not reported because I was too busy trying to find a way to help Applian and SlingMedia to live together in a better world for all of us. Anyway... here is the link to the new UMPC skin. I tested and I liked, it add a little more support to touch displays and reorganized the possition of some buttons to make it more compact in that way if fit better in our small screens. I’ve noticed a few posts wondering why we encrypted the stream (and lots of assumptions, both good and bad), and I realized I should’ve explained when we posted the build. We’ve actually been planning to enable encryption for quite some time, this just happened to be the build in which it went live. Our goal with the Slingbox is to have a device that not only offers consumers new freedom in their ability to placeshift their content, but also a product that protects the rights of the content owners and creators as a whole. Additionally, we feel protecting the stream also helps secure your rights and privacy as a consumer. To this end, enhancing SlingStream protection has been on our roadmap for quite some time. Unfortunately, it’s clear that the Applian At-Large Recorder has gotten caught in the middle of this. As a small company, we haven’t had the resources to properly support third-party developers at present, although it is our goal to eventually have an API or SDK for third-parties to use. If you consider the numerous ongoing software developments we have at Sling (Windows, OSX, Windows Mobile, other platforms, etc), we have to pick and choose where our engineering efforts go extremely carefully, and while we have very ambitious goals, we still have a lot of realities to deal with! On a technical note, a few people have surmised that the encrypted stream either increases CPU overhead or decreases stream quality. We have done quite a lot of testing and have not seen these negative results. Our tests show the encrypted stream in the new beta firmware performing side-by-side with the unencrypted stream in the current firmware with no difference. Don’t forget: if you are not doing exact side-by-side comparisons, no two streams are exactly alike! I hope this helps clear up the issue. Hum... Why not make it a selectable option? I really don't see for myself any advantage in encrypting the stream coming from my Slingbox. It's probably a good option for others but no for me. From Slingmedia answer I don't see any thing indicating that they were asked to add encryption to their player so I don't see why not to leave this as an option to be selected by users. JENN K. LEE owns a "ping" blog called Pocketables where you can find all the Information that you need about the Sony UX180P. I have been supporting SlingBox since the price went down enough for me to buy one. 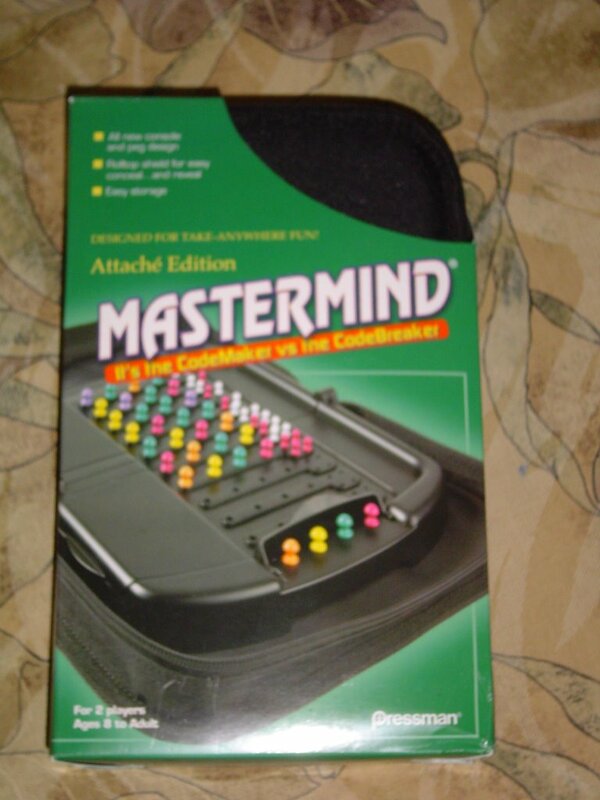 I have been enjoining it and to me it's a wonderful gadget. But today I got the email from Applian letting me know that the program that I bought from them to record shows from SlingPlayer was not going to work anymore if I update the ROM of my SlingBox with the latest version. For unknown reasons, SlingMedia has started to encrypt the stream and the At-Large Recorder can't decrypt the stream to record it. At the beginning of this week I got another message from Applian letting me know that they changed the name of the program after a long dispute with SlingMedia about this point, something that today has been made public in a post at Applian Blog. From the beginning I never liked the fact that SlingMedia charged a lot of money for their hardware and on top of that charged users for the players for Pocket PC and SmartPhone separately. Seemed to me abusive to charge for Hardware and Software. Today I think that I'm in the presence of a new SlingMedia manoeuvre to liquidate the competition for a future recorder made by them. I hope that I'm wrong because this is a very dirty move. A move that does not say anything good about the administration of this company and its owner. A money is not all in this life and competition is always good, it helps giving you a reason to fight back making a better product. SlingMedia you are about to lose all my support. Kevin at JKOnTheRun has posted a review about an USB to PCMCIA Adapter called U132. The price of this adapter is around 190 dollars. This is the same one that I mentioned here some time ago. Warning: this adapter can be used with some wireless card PCMCIA modem only. "I see the potential for a catastrophic failure in the PC gaming market out of this," he said. "The functionality of these chips is way, way below par, and it skews the development economics. For example, a game like Gears of War - there's just no way we can make that run. We can dumb it down to run on a lower-end 7-series or 6-series NVIDIA GPU; we can dumb it down to run on an ATI X1300, something of that nature - but it just will not scale down to Intel integrated graphics. It's just not possible." "Statistics show that people are moving to laptops in record numbers - laptops, as we know, are generally not upgradeable," he continued. "What I think is happening is that we're actually losing PC gamers in record numbers. People are going out and buying new computers at prices they feel should be fairly reasonable, and they're ending up with computers that make games look horrible." Hey Mark, this is not an Intel problem only, what about VIA? We've received word that the next SlingBox firmware upgrade will include encrypted streams, which will likely make At-Large Recorder inoperable. If you want to continue to use At-Large Recorder, DON'T UPGRADE YOUR FIRMWARE until we have a solution in place. This may be very difficult to do. If anyone has the new firmware installed, and has tried it already with At-Large Recorder, please let me know what happened. We'll do our best to come up with a solution. You might also want to write Sling and post on the SlingCommunity forum to express your displeasure. At-larger Recorder is a wonderful tool that allows you to record from SlingBox. Rob got an UX180P and is sharing his initial thoughts on that machine at GottaBeMobile. To me, it feels like what I thought an Origami would be. Natural. What can I say about it? Well, Sony is synonym of innovation and the exterior design of Sony's devices can be described using just one word: unique. I'm more like a stylus kind of user so for me the keyboard is not something that attracts me and the 5 inches display is not good enough for working in Visual Studio at a high resolution at least for me and my eyes. And the most important point: price. To pay around 2000 dollars for a companion PC that's crazy even for a Sony unless you will get that money back using it. But I agree with Rob, we need Origamis with keyboards in the future for those who like the feeling of typing with two fingers as much as we need current style Origamis. The latest version 3 of iGuidance a very well known GPS Navigation Software has included UMPC/Car PC support. You can buy IGuidance using this link for 109 dollars and it includes maps of USA, Canada and Alaska. OQO has received 2 Awards for Innovation and Leadership according to a "Press Release of OQQ Inc"
"OQO is honored to be recognized by Red Herring and PC Plus as a leading technology innovator and pioneer in mobile computing technology," continued Jay Shiveley, CEO of OQO. "These awards highlight the accomplishments of our team and establish OQO as the standard for UMPC-Pro computing. The market demands more from the UMPC category, and the model 01+ is our answer. These awards validate our success in meeting the market's demands." I'm glad to see that they are having a success in what they have called UMPC-Pro Computing (my guess is that the PRO comes from higher price in the UMPC Catergory competing only with Sony). But I would be a lot happier if I see OQO competing under the mark of 1000 dollars. Whereas we were fairly underwhelmed by the Samsung Q1, we're pretty enamoured with the R2H. 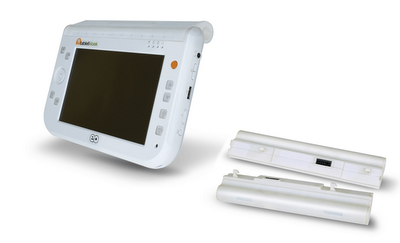 It has more features and though it's slightly less portable, we think it's much more functional. Sorry.. The cPC is not shipping in the USA yet. We are still in the process of finalizing the unit. We appreciate your continued interest and will be informed as to when it is released. Any new UMPC is welcome, I'm one of those that think that there is market for any of these small devices but in my opinion the cPC lack of one of the most important features for a device of this side: connectivity. No WiFi, no BT, that is a big NO NO for most of the people looking for a device like this. Just think that the vision of many of the software giants like Microsoft, Google and others is that in the future applications like Office wont be installed in clients but are going to be Web Based applications. Even the nowadays Pocket PCs has BT and WiFi so I do not think that the cPC is going to have a big success more when the predicted price for this device is not going that low to compete with Pocket PC, OQO, Sony and the new Origami devices all of them with connectivity integrated. The idea of having to dock your PC everytime you need Internet is not bad but no good enough for many, including me. 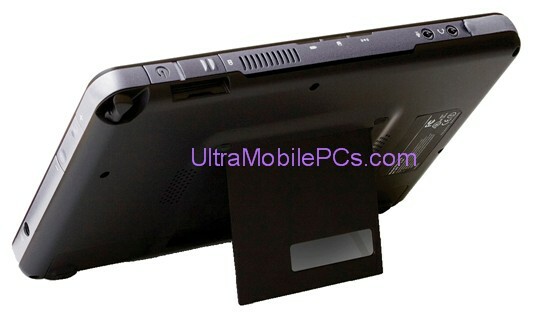 According to a poll published at TabletPC Buzz, 38% of TabletPC fans have bought or will buy an UMPC. That's a huge number taking in consideration that no everybody needs a companion PC. Hava is "Wireless solution for high quality home viewing, multicasting and remote viewing". In another words, the SlingBox competition, with the difference that the SlingBox needs to be connected to your WiFi router using a ethernet cable while Hava is fully WiFi compatible. Linda A. Epstein has posted her review of Samsung's Q1. Many of the initial reviews of the Q1 were negative because they came from from users who were not using the Q1 as it is intended which was unfair to both Samsung and to the general public. In this review I hope to set the record straight by reviewing the Q1 as it was intended to be used. And think that She did a good job trying to show the general public how useful these devices can be. Amazon is offering the SlingBox for just $156. That's around 100 dollar less than the orignal price charged by SlingMedia. I have been using mine a lot during the FIFA World Cup and I love it. SlingMedia is working in a Skin specially prepared for UMPC devices that should be available soon bu I have been using mine with the normal skin and it works perfectly in my eo. A few days ago somebody in Origami Project Forum mentioned to me a program to clone HDDs. So far I have been using Ghost for this kind of tasks but when I started to read XXClone web site I found that this program was using in this task a complete different method. Imagine that you can clone your HDD without leaving your Windows environment and even more... without having to stop what you are doing in your PC. This program copy files from your current in use HDD to any other HDD that can be even connected using an USB port. Once the process of copying all files - including system files, registry, etc - ends the program makes your new HDD bootable and all you have to do is swap the HDDs. When the new HDD is used for the first time as master, the program runs again one more time verifying that all your partitions are keeping the proper letters and that the whole process was ended successfully. From all this you can see the advantage of this program versus Ghost. Your new duplicated HDD was defragmented during the process; you can create backups of your HDD without having to open your PC, notebook, tablet pc or UMPC. It's in a few words a MUST HAVE for those thinking about to upgrade their current HDDs. Probably you wont believe all that I'm saying because that was how I felt when I read about the program for the first time. I could not believe it either until I took an old PC, added a slave HDD and cloned the master HDD, all within Windows 2000. The two HDD were 20 GB HDD with around 3 GB of data in the master HDD. The process took about 15 Mins. Once all files were copied I unplugged the old HDD and replaced it with the just cloned one. Turned ON the PC and... Even the Desktop Shortcuts were in the same position where they were in the old HDD! 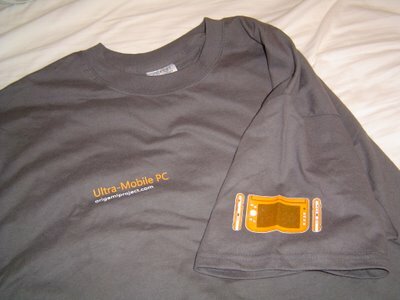 Whatisnew has published an article that I think that every UMPC fan should read. What they are saying is not a new concept, my friend Steve from Carrypad.com has been talking about it since long time ago. UMPCs have come to make the SFF Platform stronger - I like the way Whatisnew has used to name this concept!. The Small Form Factor platform unites Sony’s product line with the UMPC platform. Add in the Nokia product line as well as OQO’s product line and we no longer have competing terms with winners and losers but rather an era of building a new platform for all consumers. And while we are hugging each other, bring in Apple and Linux users. These two groups tend to bring in unique perspectives that might help stretch the products into being even better. Finally, add in a universally accepted aspect of all good products – a good price to performance ratio. I think that at this moment we have people asking for cheap 5" devices running XP and people that love the 7" devices. For me the 5" are more casual type of devices. You can browse the web, send some emails, shot some pictures and even use them as phones. But I don't think that you can use them for more complex things like entering data into a database, filling forms or coding in Visual Studio, for those kind of taks a 7" display works a lot better. Setting this value to 1 is useful when debugging drivers, because all of the code and data is always memory resident. It also improves performance on machines with a lot of memory, because it prevents disk reads to get code or data - According to Microsoft. Synaptics has released a new driver version V8.3.4 that can be downloaded here. I recommend this update to all eo owners. A new picture of the extended Battery for eo V7110 has been posted this time by Pocket Solutions, reseller of TabletKiosk UMPCs in UK. 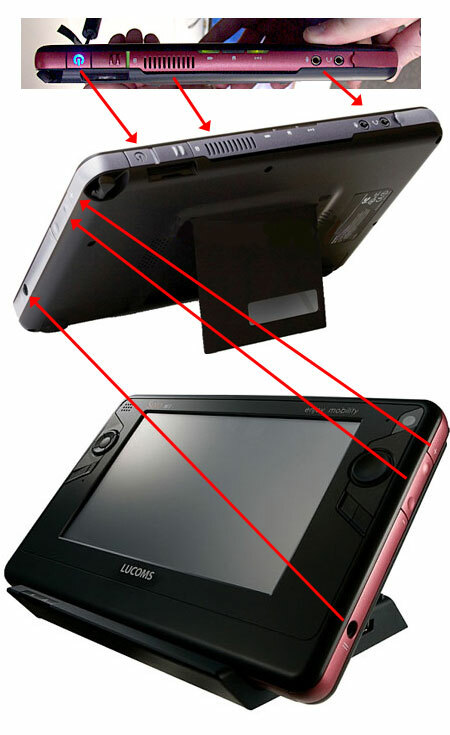 I'm writing to inform you that we are definitely in the works for developing ClearTouch screen protectors for UMPCs. We will let you know as soon as we have them available! Yesterday I was reporting here about me testing ritePen. But probably some of you entering in the Tablet PC world thanks to these magnificent Origamis do not know what is ritePen. And probably many of those who found out what it is thought that having the Tablet PC recognizer from SP2 you don't need such software as ritePen. ritePen is "is an advanced handwriting recognition software for Windows-based pen computers." And the most important feature to me is that it combines its own recognition engine with the native Windows recognition. So if you thought that Windows Recognition was good enough now you have a tool that allows to have a more powerful recognition. Another advantage of ritePen is that it allows you to write in anywhere in your UMPC screen. And on top of that it allows you to use gestures for common tasks such as Copy, Cut, Paste and Undo. Like I said Yesterday, it's a little bit tricky to make it work properly in eos due to a combination of things like the touch screen type, video chip not being use properly, video drivers no properly optimized, etc. But once you get used to it and you tweaks a little bit your eo, you are going to love it. From what you write, it really sounds like the display driver is faulty (did you observe more of "missing segments" or "shape distortions" in the handwritten trace?). Well, this is not something new, the drivers in eos are far from being "perfect". Anyway, to get it properly working I had to change the display colors from 24 bits to 16 bits and change in the ritePen settings the pen width to the thinner possible. After these changes the program worked fine. This T-Shirt was sent to most active members of that community. Thanks Microsoft! I read some reports just after the first batch of eo was released about people installing VISTA. I know for fact that it can be done but I would like to know what have been the experiences of those brave guys that installed it in their eos. do they still have VISTA installed? Any problems with drivers? UMPCs (Ultra Mobile PCs) is an exciting new category of devices that can fit comfortably into a pocket or handbag enabling users to access and interact with their entire digital world wherever they go. Creating exciting opportunities for entertainment, productivity, and communication focused products the VIA VX700 is the next step in this mobile future, enabling smaller form factor "computing" devices with reduced power consumption and enhanced functionality. As the first single chip implementation of its kind for ultra mobile devices, the VIA VX700 continues VIA's history of chipset innovation and blazes a strong path for a new breed of digital companions. The new features included in this processor are just incredible, like "Powerful image enhancement technology delivering a Hi-Def™ visual experience including advanced video acceleration for MPEG-2, MPEG-4, and WMV9." Now, I have few questions to VIA: are they going to support for real these new features implementing a good set of drivers, tools and software or these features are going to be sitting in there waiting to be discovered like they did with the C7-M? will be able regular media players without too much of difficulties to use the mpg-2 and mpg-4 decoding capability? C7-M has MPG-2 decoding capability and only one or two programs can use it and only after a lot of tweaking! 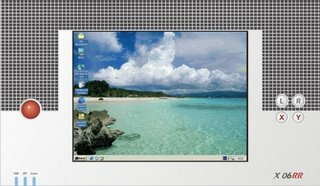 will be able Windows Media Player 10 to decode WMV9 without any tweaking around by users? Because in C7-M WMP does not seem to recognizer any video acceleration when you are playing DVD movies (MPG-2). I'm trying to keep an open mind here - somebody asked me that ;) - but it's hard when you have a C7-M installed in your UMPC that works perfectly well when using tools created by VIA like StrongBox but that does not perform well decoding MPG-2 because apparently nobody knows how to use this feature. And VIA has not released any little Video Player. I also hope that VIA is going to work this time with hardware makers helping them to configure the processor. It seems to me that this is the only way to see finally a VIA processor entering in C3 State. If this happens, probably we are going to see the 2.5 hours of battery life that current C7-M based UMPCs are supposed to have. At this moment all I see is the usual well written but hollow VIA proganda, full of promises that they have failed so far to deliever. And I dare them to prove me that I'm wrong. GottaBeMobile has just released an "InkShow" about Pen Flicks, a new feature coming soon with Vista. Pen Flicks are gestures that allow you to do simple navigational and common functions more quickly and with less effort. Things like scrolling down, copying text, issuing a keyboard command with a stroke of a pen, etc. According to a picture included in Asus User manual, the Battery life on this UMPC should be around 2:55 hours. It's unknown under what conditions. The first picture of the Q1 Battery has been posted at Origami Portal Forum! According to the Source he is getting around 5 1/2 hours out of this battery browsing the web while listening to mp3s. Asus R2H just got the FCC approval according to news published at OnlyUMPC. You can download the User Manual and you can check a lot of pictures of this device and some of the accessories that Asus is planning to sell with it. It seems to me that Asus is going to hit the market fully loaded! 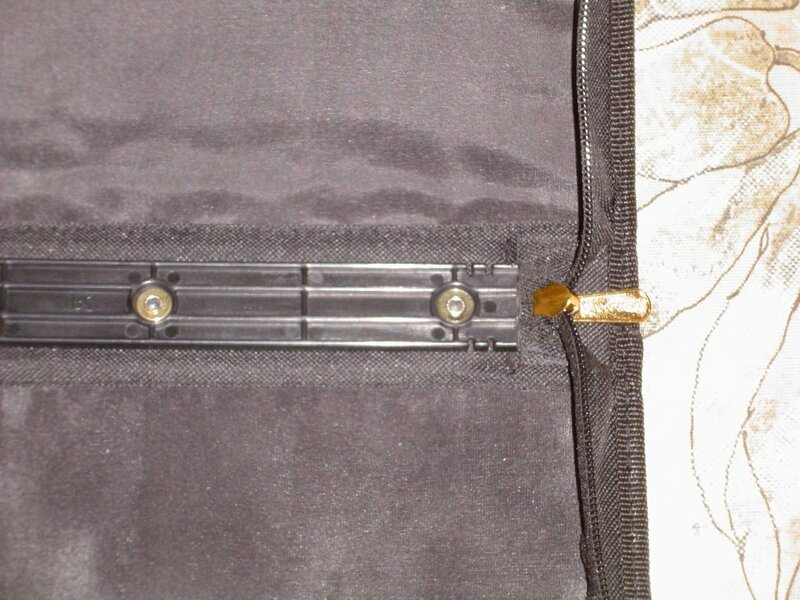 Carrypad has published the first known picture of the eo V7110 Extended Battery. The Extended Battery should have a life of around 4 to 5 hours and can be purchased here. Besides Tablet PCs, the closest thing to an UMPC is a Pocket PC. And probably this is the reason why forums totally dedicated to Pocket PCs have opened areas to discuss this new category. That's the case of Wornhole Creations, the bigest Pocket PC Community in Australia, that has just created a Sub forum to talk about UMPCs. Do not forget that those affected by the recall can apply a 25% discount to this must have item. Since Yesterday I'm officially posting news at UMPCBuzz. Since Origami Project was revealed by Microsoft I felt attracted by this concept and I have been posting news about it here in my blog and then in few other forums including UMPCBuzz. And this news was reposted in front page later by Layne Heiny, the brain behind UMPCBuzz. Layne is currently busy in his doctoral studies and thought that once I'm posting all this material in his Forum l could help him if I post it in the main blog (Front Page). In a very peculiar way he just added me as administrator and with that came the "privilege" of posting in his main page. What an honor! Well, thanks Layne. So now all you know guys, you can read my "Broken English" news here and at UMPCBuzz. Tablet Enhancement for Outlook 3 Beta 3 has been released by Josh Einstein. I just installed it in my eo and it seems to be working find. This tool is considered by Tablet PC owners a "must have" and it has a trial version that run for 14 days that can be downloaded here. Rob Bushway, from GottabeMobile, has published a master piece. In a few paragraphs Rob has put in white and black what any tableteer or Origami owner would like to see in VISTA. Unfortunately one more time Microsoft is missing the great opportunity of adding in the OS full support for ink. Now, why does this bother me so much? Vista is going to be here to stay for quite a while. The experience we have with Vista right now is going to be with us for at least another 4 – 5 years. Barring a major service pack or feature release that addresses these issues, it is going to be 8 – 9 years after the Tablet PC launched before we can expect to see another significant opportunity for Microsoft to get this one right. 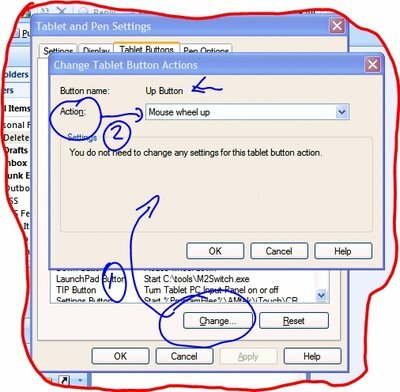 It is a missed opportunity at a very important point in the life of the Tablet PC. Rob, I'm 300% with you in this one. Microsoft, we want ink! I learned about how bad Toshiba's Tech Support was when I bought my e740 around 4 years ago. So Today I was very happy to see how "Better Business Bureau" gave Toshiba an F for it's bad service in USA. Complainants allege defective merchandise and failure to honor warranty claims. Many customers who purchased Toshiba Laptop computers claim the units have an overheating problem due to malfunction of the cooling fan. Other complainants allege delays when computers are sent to the service department for repairs. Some report their computer has been returned two or three times for the same problem, or, that repairs performed did not remedy the problem. The company responds to some complaints by offering additional repairs, or explanations of warranty provisions. Some complaints are unresolved, meaning customers are not satisfied with the company's response. Many other complaints remain unanswered. This company is one of those companies that sometime I wonder if they have anyone speaking in English in their offices in Japan. During the year that I had the e740 I wrote dozens of emails to every CEO email that I could find posted on the web and I never got any reply back. Toshiba USA and null is the same thing. They do not know anything of anything and they are always ready to blame Toshiba in Japan for every single problem. That's why I was so happy when at the beginning of this year they said that they were not thinking about to release any UMPC. I think that we have already enough problems to add the incompetence of such company. 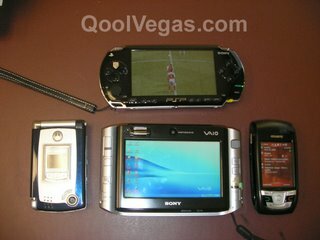 I found some interesting pictures and videos of the Sony UX in this Spanish forum. The video can be found here. Basically the owner is very happy with it and He likes how it perform. No question about it, Sony is the No 1 company in design! But... I still think that 7 inches is the optimal screen size available to run XP.